La Jolla, CA – Jack’s magical beans may have produced beanstalks that grew and grew into the sky, but something about normal, run-of-the-mill plants limits their reach upward. For more than a century, scientists have tried to find out which part of the plant both drives and curbs growth: is it a shoot’s outer waxy layer? Its inner layer studded with chloroplasts? Or the vascular system that moves nutrients and water? The answer could have great implications for modern agriculture, which desires a modern magical bean or two. Now, in the March 8 issue of the journal Nature, researchers in the Plant Biology Laboratory at the Salk Institute for Biological Studies provide the answer. They succeeded in making tiny plants big and big plants tiny by controlling growth signals emanating from the plant’s outer layer, its epidermis. These findings could eventually be used by agronomists to manipulate plant growth pathways to maximize crop yield, or even reduce leaf size or leaf angle in plants that need to be spaced closely together, says the study’s lead author, Joanne Chory, Ph.D., professor and director of the Plant Biology Laboratory and investigator with the Howard Hughes Medical Institute. 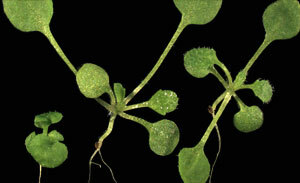 On the right is a normal Arabidopsis plant, on the left is a dwarfed brassinosteroid receptor mutant (bri1) and in the middle is a bri1 mutant plant in which the receptor has been expressed only in the epidermis. Image courtesy of Sigal Savaldi-Goldstein. Chory and her laboratory team have spent years helping to define how a plant “knows” when to grow and when to stop – which is a “big question in developmental biology,” she says. For their experiments, they rely on the model system Arabidopsis thaliana, a small plant related to cabbage and mustard whose genome has been decoded. Over the years, the researchers have built up a whole tool kit, learning how to add and subtract genes in order to determine form and function. Among their discoveries is a class of dwarf plants whose size is about one-tenth the size of a single leaf of the full-sized plant. Over the past decade, Chory’s laboratory and others have shown that these dwarf plants are defective in making or responding to a steroid hormone called brassinolide. Among the genes identified was the plant steroid receptor, BRI1 (“bry-one”) that is activated by the steroid. The dwarfed Arabidopsis doesn’t express BRI1 at all, unlike normal Arabidopsis, which expresses BRI1 on both the outer waxy, protective epidermis (covering the whole leaf and shoot), and the inner sub-epidermal layer, which contains the chloroplasts that conduct photosynthesis. They found that when they drive the expression of the BRI1 receptor in the epidermis of a dwarf Arabidopsis, while leaving the sub-epidermal layer as it was (without BRI1 receptors), the tiny plant morphed into a full-sized plant. In the second set of experiments, they used an enzyme to break down the steroid hormones in the epidermis, and found that a normal sized plant shrunk into a dwarf. “These are simple experiments, but it took 10 years of work in order for us to be able to ask this question,” Chory says. “A second remarkable finding from the study is that “cells in the outer layer talk to the cells in the inner layers, telling them when to grow or to stop growing. This communication is very important to the life of a plant, which can’t move and so must have a coordinated system to respond to a changing environment,” explains Savaldi-Goldstein.